Refrigerated water baths are widely used for day bacteriological and varied laboratory application requiring incubation as well as general test and procedures in a variety of research and testing laboratories including Wassermann, Kilmer tests. Apart from that these refrigerated water baths have a variety usages in tissues culture application, enzyme reaction studies, growth observation studies, fermentation analysis and various other general specialized application in various laboratories. We specialize in both standard and customized models, specifically designed to meet the challenging demands of various scientists for individuals and specialized research application. Apart from that we are supplying out refrigerated water bath in India catering to variety of customers ranging from defense installations, Research laboratories, Educational Institutes and various R & D laboratories of leading a national an multinational companies. Our refrigerated water baths are double walled convection heated units, outer body of our refrigerated water baths is constructed out of thick PCRC steel sheet, duly pre-treated with primers for rust proofing and painted with air drying paint / stove enamel / powder coating. The inside chamber of the unit is made of heavy gauge stainless steel sheet of grade ss304. the unit is provided with one stainless steel racks. 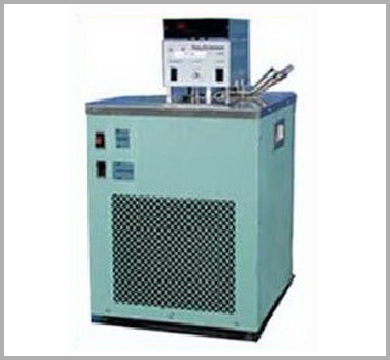 Indirect heating system is provide in our refrigerated water bath comprising of air heaters made of high grade kanthal A-1 wires of suitable wattage. The temperature is evenly distributed throughout the chamber through natural water convection mechanism ensuring a very good temperature sensitivity. An energy efficient cooling unit is installed in our carbon dioxide incubator to enable bio chemical demand studies at lower room temperature. We uses ISI marked high end CFC free comressors of kirloskar / Tecumseh make, conforming to latest international standards and guidelines. Front panel of our refrigerated water bath comprises of on / off switches h heating & mains indicator lamps and temperature controller. Standard 5 lt/10 ltr/20 ltr/35 ltr/ 50 ltr. Note : The above mention sizes are of our standard refrigerated water bath. However we are fully capable to cater to demand of any customized size for any special application.